At Camp Altitude Gym (our friends call us Camp Altitude), we believe that if children have fun doing physical activities, they are more likely to stay active for life. We also believe that by choosing rock climbing, they will develop specific skills in this sport including confidence, perseverance, self-improvement, problem solving, endurance, flexibility and strength. Camp Altitude offers two fantastic sites. In Gatineau, activities are offered in an old church that has become a climbing centre. This is a French-speaking environment with bilingual facilitators who will ensure that instructions are given in the children’s preferred language. In Kanata, the camp is set up in an industrial building. The activities are conducted in English with bilingual instructors for the children’s comfort. 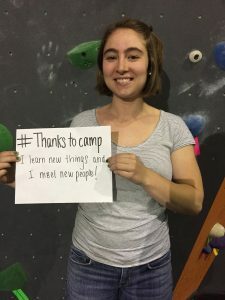 To participate in Camp Altitude is to live unique experiences in a grandiose site, to discover a sport in full expansion, to have fun in a safe environment, to learn that with effort and perseverance, you can succeed in what you undertake. We’re gonna climb and have fun all summer long! If you want to join in, come on and sing this song. We won’t be scared to reach up to the highest peaks. Here we go! oh! Oh! Straight to the top we soar oh! Oh! We are Camp Altitude Gym! Gem has her Diploma in Recreation and Leisure Services and has been working at Altitude Gym since July 2017. Gem loves introducing new climbers to the sport and giving them a chance to try something new! When she’s not bouldering, she also likes spending time outdoors and rollerblading. Keep an eye on this page to learn about all the members of our next camp team! Each year, about fifteen dynamic and caring people are specially chosen to offer a wonderful summer to the campers. If you’re at least 17 years old, love children and climbing, are enthusiastic and creative, we want you on our team! Spending your days in a breathtaking environment. “You want to be part of our exciting team? Send your resume and cover letter to emploi-job@altitudegym.ca for Emma Gagne’s attention. We’re also looking for volunteers to help in our camp. If you’re at least 15 and would like to gain valuable work experience, email your resume and cover letter to emploi-job@altitudegym.ca for Emma Gagne’s attention. You have questions our website left unanswered? Email us at summercamp@altitudegym.ca or call us at 613-903-5989 ext. 304!